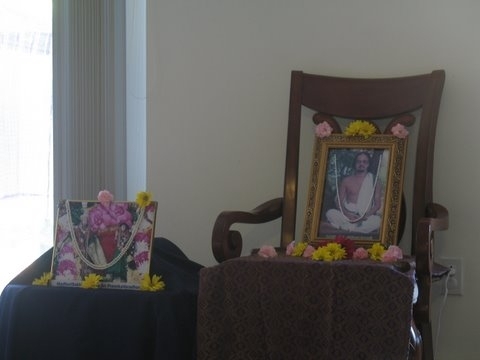 Event: New England devotees celebrate Guru Poornima with Namakirtan. What better time could there be to pay our respects to our Guru, if not on Guru Poornima? 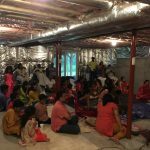 The devotees in the New England area decided to celebrate the event with satsang and Namakirtan. Thus the satsang began with 20 min chanting of Mahamantra – Sri Sri Swamijis most favourite. 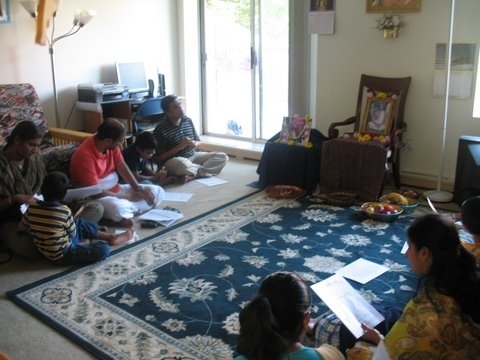 The devotees then recited the Gopika Geetam. This was followed by a few bhajans highlighting the greatness of the Guru. 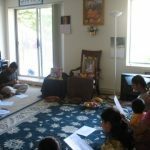 The kids were also enthusiastic and showed their gratitude to the Guru by reciting a few slokas. Kumari Manasa sang one of Sri Thyagaraja Kritis. A few devotees sang Namavalis. 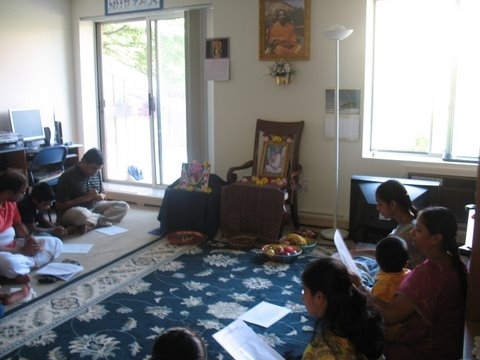 The elder devotees and the kids took part in chanting the Bhagawata Dhyana slokas. 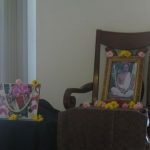 Smt Nithyaji gave a short talk highlighting the need for Guru. Examples of Sant Kabir’s efforts to attain a Guru and get the upadesa of Rama Nama from Him, Guru Bhakti of Sabari and Purandaradasa etc were quoted to explain Gurus holy feet would help one reach the highest state. The satsang concluded with Mahamantra kirtan and Sri Sri Swamijis kirtan Kirtanam Paadire. 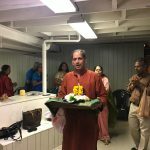 Harathi was performed and prasad was distributed to devotees. 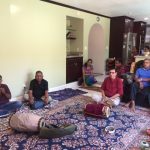 Certainly, the 20 devotees who took part in the satsang were recipient of Gurus grace.